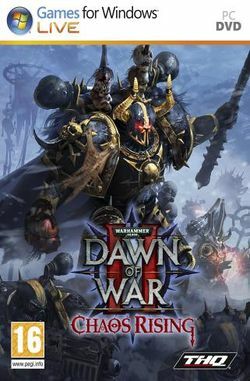 Warhammer 40,000: Dawn of War II: Chaos Rising is a real-time strategy video game for Windows developed by Relic Entertainment and published by THQ. Chaos Space Marines are introduced in this game and all the races in the previous game (Space Marines, Eldar, Orks and Tyranids) are given new units. The Chaos Space Marine Commander is Eliphas the Inheritor, from Dawn of War: Dark Crusade. It is currently unknown, however, how he had managed to survive, as the Space Marine faction won the Kronus campaign (the fall of the Chaos stronghold ends with Eliphas' gruesome death at the hands of the vengeful Daemon Prince), or how he is now part of the Black Legion, as he was originally from the Word Bearers. However, accordingly to the 5th edition Codex: Chaos Space Marines, Chaos Space Marines of all origins are able to join the Black Legion. Therefore, it is possible that Eliphas joined the Black Legion at some point between the end of the Kronus campaign and the events of this game. This page was last edited on 30 May 2016, at 14:46. This page has been accessed 20,542 times.